The old way does not work for us. It works only for the political class. We need to change the old way of politics; and replace old power with new power! We have been speaking about what Dhan Vapasi is for the past few weeks. One lakh rupees must be returned to every family every year. This is not only morally justified but also economically efficient. We can solve three hamesha problems at the same time — of poverty, unemployment and corruption. Today let’s focus on the how to make Dhan Vapasi a reality. So what exactly is the biggest barrier to Dhan Vapasi? The biggest barrier to Dhan Vapasi is our political class. They have captured our wealth. We have allowed them to take our wealth. We have made the mistake of giving up our independence — first to the British for 150 years and then to those who took over control from the British, the political parties for the past 70 years. But the good news is that we have the power to change the system. We have the power to take a new direction. The old way does not work for us. It only works for the political class. India’s politicians and their friends have become rich while we Indians remained poor. So how does the system work now? The leaders of the political parties have all the power and control. They choose who is going to represent us. We the people have no say in who will represent us. We are only allowed to press a button in the voting booth. And the political parties spend enormous amounts in bribing people to vote for them. Too many people fall for this scam every election and we get bad governance. With our votes we give them the power to rule us. They gain massive wealth and unquestioned power. India’s democracy exists in name only – we are voting for the masters who make us work like their slaves, and force us to dutifully pay whatever taxes they impose on us. India has become less of a democracy and more of a kakistocracy — a system in which the governments are run by the least qualified and the most corrupt. We cannot expect those who benefit so unfairly from the power they have to make any change that reduces their power. We have to use our power to change the system so that it becomes more accountable, more transparent, and a relationship of equals instead of a master-slave relationship. We have to use our vote to change the system. We need to change the old way of politics –we need to replace old power by new power. And we have to do it now. Old Power is held by a few, is pushed down, is commanded, is closed and is transactional. Using Old Power, political parties have stolen our freedom and our wealth. 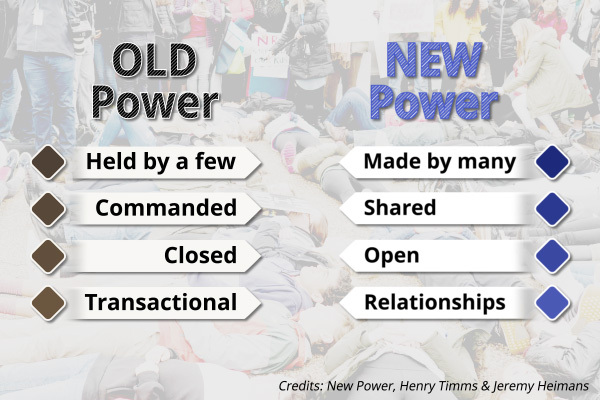 New Power is made by many, pulled in, shared, open and based on relationships. New Power does not need a political party, it needs a technology platform to connect us all together. With New Power, we can make political parties irrelevant. How? By using technology to change the game in our favour. We have to select those people for political office who will make Dhan Vapasi happen. We the people are at the heart of the New Power which can disrupt the political parties. We are the 70 crore voters who are not attached to any of the political parties. We are in the majority, we are 2 of every 3 eligible voters. How we can use new power and technology to defeat the old power of the political parties and their friends to make Dhan Vapasi happen will be the subject of my next chat.